Coastal flooding is a problem wherever development has occurred adjacent to, or on, beach systems. The problems of maintaining these areas are accentuated by naturally rising sea levels over most of Newfoundland. Floods usually occur when storms coincide with high tides and can include overtopping or breaching of barachois beaches. Flooding of this type can be very destructive. Flood risk maps (link to these maps shown in the freshwater thread) have been prepared for flood-prone areas through the Canada - Newfoundland Flood Reduction Damage Program. 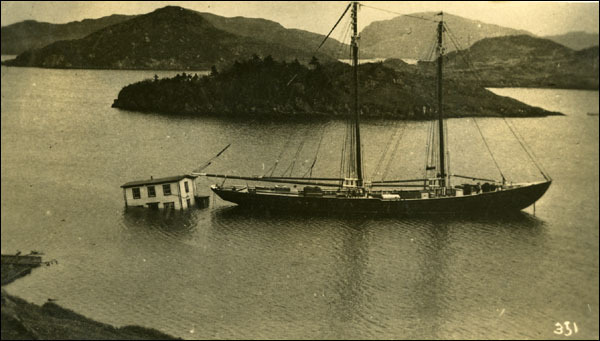 The worst geological related hazard in the province's history was one of coastal flooding associated with the Grand Banks tsunami that struck the Burin Peninsula in 1929. Incidences of coastal flooding in Newfoundland and Labrador are shown on the map below. Possibly the most vulnerable area to coastal flooding in the province is Placentia. The town has a history of flooding, aggravated by urban development over the past 15 to 25 years into the area directly behind the beach. 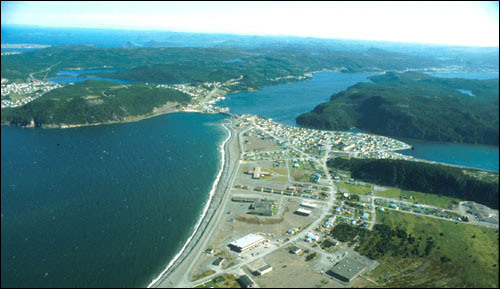 This aerial view of Placentia shows a community built on a beach-ridge complex, very close to sea- level. Reproduced by permission of the Government of Newfoundland and Labrador © 1990. Flooding in Placentia occurs either as a result of high water levels in the estuary (which may be caused by storm runoff, storm surge, high tides, or a combination of these) or as a result of storm wave run-up and overtopping along the outer beach, or both. The most damaging recent flood event occurred in January 1982, when high waves were superimposed on very high tides. Severe flooding also occurred in December 1983 and (less severe) at Christmas 1992. The Department of Municipal Affairs has responded to this problem by constructing shoreline defenses, at a cost of about $3 000 000. 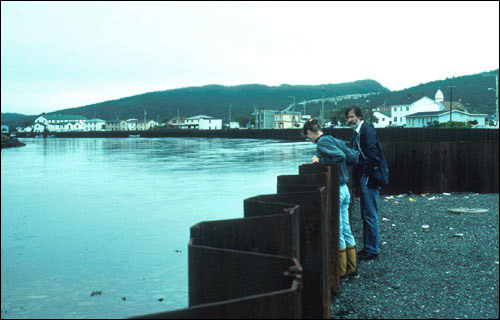 To reduce flood damage at Placentia, a sea wall has been built along the harbour. The Burin Peninsula has numerous communities situated at low elevations behind barrier beaches on a coast threatened by rising sea levels. Coastal protection measures have been constructed in a number of vulnerable areas, including the site of recent Provincial Park developments at Frenchman's Cove. The vulnerability to flooding was emphasized by the disaster associated with the 1929 tsunami. An earthquake on the Grand Banks, measuring 7.2 on the Richter scale produced a tsunami that radiated out from the epicentre. The earthquake was recorded in Nova Scotia and New York in the west, and Portugal in the east, but impacted most severely on the Burin Peninsula. The tsunami traveled at speeds up to about 500 km/hr through deep water, and about 140 km/hr over the continental shelf, but had slowed to about 40 km/hr upon impact with the coast. It arrived as three main pulses, causing local sea levels to rise between 3 and 7 m. Twenty-eight lives were lost on the Burin Peninsula. Total damage to property was estimated at about $1 million (1929 dollars). Schooner rides at her mooring after towing a house back into harbour. The house had been washed out to sea during the Burin Tsunami of 1929. Photographer unknown. Reproduced by permission of Archives and Special Collections (MF 391.1.06), Queen Elizabeth II Library, Memorial University of Newfoundland, St. John's, NL. The frequency of tsunamis is uncertain. Alan Ruffman (Geomarine Associates) suggests that earthquakes of the magnitude that triggered the 1929 tsunami are 1 per 1000 years, but could be as low as 1 per 100 years for magnitude 6.0 earthquakes. The province has experienced at least 7 other earthquakes, mostly of a minor nature. Apart from the Burin tsunami, two others have been reported, at Bonavista in 1755 as a result of the Lisbon earthquake, and St. Shott's in June 1864. These caused damage, but no reported loss of life. The stretch of highway that crosses the mouth of Holyrood Pond on the southern shore of the Avalon Peninsula is prone to coastal flooding. Despite the unusually high elevation of the barrier crest (more than 7 m above mean sea level) this road has been washed out at least twice in recent years (during storms in January 1982 and March 1985), and the community of St. Vincent's has been flooded. In an effort to raise the barrier crest and limit future flooding, an artificial gravel ridge and wooden sea wall were constructed. The effectiveness of this structure remains to be assessed.